Short Answer: Yes. Long Answer - read below. Depending upon which source you trust [1, 2, 3, 4, 5] - anything between 88 to 30 percent of people admit to using mobile phones (talking, texting and using apps) while driving. Several cars (even those not so pricey) available now integrate your mobile phone with the car stereo systems acknowledging that usage of mobile phone while driving is not just acceptable but also to be encouraged and aided with technology. Given these stats, is it really worth having laws which prohibit mobile phone usage while driving? These laws are similar to the sermons of the 16th century Church which decreed the Copernicus system of astronomy to be false. I remember one of my maternal grandfathers telling me that is mother never allowed him to ride a moped or a scooter in his youth because she was afraid of accidents. (Ironically, he got injured on the road was when someone else hit him while he was walking on the pavement.) Laws which prohibit mobile phone usage while driving have been devised with a thought process similar to the great granny - don't use technology because it might lead to accidents. Some might also argue against this logic here and say that just because a majority is committing the crime, does not make the crime illegal. But one ought to look at the situation differently here - talking on the phone is not a moral felony like genocide - so on cannot really compare it to 'crime by the majority'. We need to ask the question as to why, in spite of laws, and examples of numerous accidents involving distracted driving, do people continue to use mobiles while driving? The answer to this question lies in essential human nature - humans are social animals - given a chance, any human will prefer talking and interacting with others. Even before the advent of mobile phones, people preferred being distracted while driving - listening to radio, chatting with the co-passenger, waving to a friend over the pavement or subtly watching a beautiful woman (or handsome man) in the next vehicle; people did all this while negotiating through traffic without really giving it a thought that these actions are potentially hazardous. I am not sure how these distractions compare to talking on the mobile - they might distract less or may occur less frequently - but had someone conducted a study, we would have deduced them also to be source of majority of accidents prior to the mobile phone era. The point I am trying to make here is that, for people whom commuting is a daily routine, its a chore and hence intrinsically a waste of time. Hence people will use various means to use this commute time more productively - reading, listening to music, talking to someone on the phone, or using an app. And where we do not provide efficient or sufficient public transport solutions, commuting will come through the way of self-driven private vehicles. But irrespective of the mode of transport - people will treat commute as a chore and hence distractions while driving are a reality which we need to accept. So what's the solution? 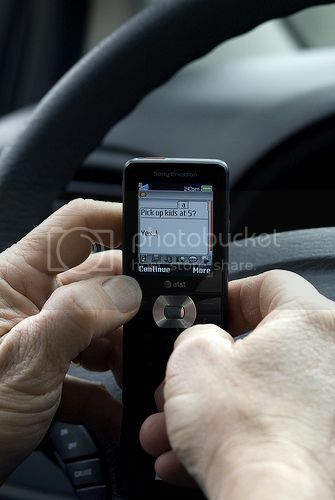 Do we accept accidents due to distracted driving as collateral damage which is unavoidable? Well ... What God taketh, God giveth! on similar lines - What problem Technology creates can as well be solved by Technology. Read the next part of this post for more. 1 Comments to " Is talking on the phone while driving illegal? [Part I] "
Mobile phone usage should be permitted by law. It is upto the end user to make sure that mobile phone usage does not result in any mishap and risk anybody's life.